Flower Fields collection/2015. Top, background and binding fabric. Different fabrics: Flower Fields collection, Island Batik/2015. Same pattern: Majesty, Medallion IX, 36" x 36". But with a totally different look (than the hand version). I love these bright, playful, joyous fabrics. But I have to admit that when they arrived, I was a little worried. The fabrics didn't have the contrast to each other that I thought they would from the digital images I viewed to select them. This is where I trust God, and hope that what is different, may actually be a creative blessing in disguise. Soft fuse with design traced, ironed onto wrong side of top fabric. So, the adventure begins. This version will be constructed by machine using our trace, iron, snip & stitch process with Appli-quilting. I start by laying my soft fuse on the full-size, black and white pattern, with the paper side up, and trace all the shapes in the design using my pencil. Then I iron the soft fuse with the design on it onto the wrong side of my top fabric. Using my small sharp scissors, I like my N5100B 4" bent handle Kai scissors, I cut out the shapes in the design. Next I peel the paper off and iron the top onto the right side of my background fabric. To Appli-quilt, I layer the fused top, my batting and backing. When I machine stitch, covering the raw edges, I will machine applique and quilt in one step. This combination of fabrics is bright and vibrant, (which is what I wanted), but the values are so close, its hard to see the pattern design, (not quite what I wanted). It is full of bright, saturated color. Once appli-quilted I know the design will be seen, but I envisioned greater definition. So, I started brainstorming. What color thread should I use? Did I want the piece to have a subtle, yet vibrant look or see more distinct shapes? 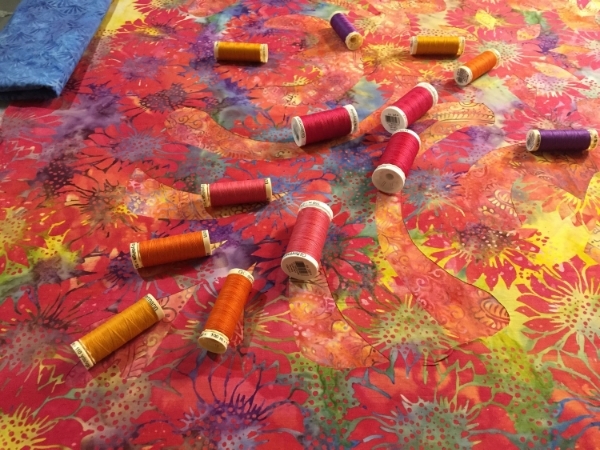 An assortment of thread colors to augment the design and fabrics to create a complete whole. As I pondered the piece, I started envisioning it with different colored threads. My thread drawer did not have the right thread colors, so I gathered the piece up and took it with me to Jo-Ann's to play with threads. I think this will work, creating something different than I first imagined, but still lovely. We will have to wait and see together. This piece is off to be appli-quilted by the EOB Machine Elf, so we have to live in suspense to see the final results.